The investigation conducted by a joint Swedish-Russian Working Group about Swedish ships lost during the Cold War leaves many important questions unanswered. The Swedish Foreign Ministry has not disclosed the information publicly because the official Swedish-Russian Working Group formed in 1993 to investigate the disappearance of Swedish ships during the Cold War never produced a final report. Surprisingly, Swedish officals did not seek independent verification of the find, explore the cause of the sinking or ask Polish authorities about the fate of the crew. The newly discovered information also raises questions about other Swedish vessels that vanished off the coast of Poland from 1946-1955. In August 1993 the Polish Foreign Ministry informed an official Swedish-Russian Working Group examining the cases of about seventeen Swedish vessels that had disappeared during the Cold War that the wreck of a ship that matches the description of the « DAN » had been discovered already in 1957 in Polish territorial waters. [Document 1] According to internal UD documents, the « Wreckbook » of the Polish Navyshows that the boat was found 3.5 km north of Jastrzębia Góra and was partially lifted already in 1964. The memo further states that since the debris was discovered at the bottom of the sea, it was assumed that the crew had gone down with the ship and that there were no survivors (UD Arbetspapper, 2001-9-27.) The suspected cause of the sinking was a mine. The « Dan » had originally been believed to have gone missing with a seven person crew somewhere outside of Latvia. Did Polish/Soviet authorities sink any of the lost Swedish ships in retaliation for smuggling or espionage activities? New information from the archives of the Swedish Military Intelligence Service (MUST) shows that the Swedish Defense Staff considered exactly such a scenario for « Kinnekulle » and « Iwan » which had both disappeared on the very same day in February 1948. The « Iwan » in particular had been involved in illicit smuggling operations which had earned it the nickname « Pirate Ship » among sailors. Polish officials had repeatedly warned Swedish crews about the extent of their smuggling activities. Swedish authorities, including the Swedish Security Police, the Customs Office and the Swedish Foreign Ministry were fully apprised of these warnings. Secondly, to what extent did Swedish intelligence use Swedish ships for espionage purposes and were any of the missing ships involved? New records reveal that in August 1946 the Swedish Defense Staff used the ferry « Drotting Victoria » to infiltrate one of its agents into Poland. The same ship was later used to smuggle a prominent Polish politician and his wife to Sweden. The flight of Stefan Korbonski in November 1947 sparked an international incident and led to months of tense negotations about continuation of sea traffic between Sweden and Poland. « Iwan » and « Kinnekulle » disappeared just three months later. As Swedish documents show, the men of the « Kinnekulle » were suspected of having visited an area near a Soviet military installation outside of Ustka (reportedly a facility for launching V-rockets). Since the end of World War II Thede Palm’s T-Kontoret gathered valuable intelligence (humint, signal and photographic) through Swedish fishing and trade vessels about conditions and Soviet ships encountered in harbors across the Baltic and Black seas. Grateful customers included British and U.S. intelligence but also Sweden’s Nordic neighbors. The third and most important question is what happened to the crews and what efforts were made to establish the fate of the sailors? It may well be that there were no survivors of all of these incidents and accidents. Given the fact, however, that it is now clear that all nine ships were lost in Polish waters, it is unlikely that no information exists at all in Polish or Soviet era archives. It is of interest to note that no other country than Sweden suffered comparable human losses in their ship traffic with Poland. A joint Swedish-Russian Working Group investigating these cases came to similar conclusions. It did its best to pursue information in Polish and Russian archives. In Poland, it had the cooperation of IPN, the Polish Institute of National Remembrance (IPN.) IPN has the official task of investigating crimes committed against the Polish nation under Nazi and Communist rule and its researchers in some cases consulted more than a dozen different archives in Poland for traces of Swedish sailors. IPN has the authority to recommend and initiate formal criminal probes. In Russia, the Working Group consulted with historians from the human rights organisation ‘Memorial’, especially regarding the fate of the crew of the ‘Bengt Sture’. The Working Group held six official meetings between November 4, 1993 and May 7, 1998. It included on the Russian side representatives of the Ministry of Foreign Affairs, Ministry of Defense, the Navy, the Ministry of the Interior and the Federal Security Service (FSB). The Swedish side was represented by Swedish Foreign Ministry official Nils-Urban Allard, the former Naval Attache in Moscow, Magnus Haglund, military historian Stellan Bojerud and Bengt Kappelin (deceased), representative of the families of the missing sailors, as well as Igor Ustimenko as independent expert. The group formally disbandoned only in 2010, without writing a formal report. The Working Group made extensive efforts to trace the crew members of the « Bengt Sture » that had been sunk by a Soviet u-boat in 1942. The Working Group followed up information that members of the crew had been held imprisoned in Leningrad in late 1942 when all traces vanish. (One theory is that the crew fell victim to German bombing attacks during the siege of the city in 1942/43). Russian officials conducted an extensive search through a wide variety of archives, but found no further leads. The Swedish side never made an effort to verify the information obtained from the Polish Foreign Ministry regarding the ship « DAN ». In their 1993 communication, Polish officials had expressed themselves with some caution and had offered no proof that the wreck they had identified as the « DAN » was in fact the missing Swedish vessel. [The coordinates of the wreck are in fact very close to those of the « Sten Sture » which was not officially discovered until 1977]* Yet the Working Group did not seek any exploration that would confirm the finding nor did it place any follow-up requests to Polish authorities to find out about the fate of the Dan’s seven person crew. Instead, Swedish officials simply concluded that since the ship « almost certainly is the « Dan », the case can be considered closed. [« I arkiv har de polska myndigheterna hittat uppgifter om ett vrak som med stoersta saekerhet aer « Dan »; »Fallet Dan kan far anses vara loest i och med de uppgifter som kommit fran den polska sidan », P.M. Benny Forslund, 2001-9-27] As a result, the « DAN » was completely off the agenda of the Working Group after 1993 [it already was not discussed at the first Working Group meeting in 1994] and there were no inquiries conducted regarding several testimonies about the ship having drifted into Latvian territory. Several Baltic refugees had reported the ship in the harbor at Libau shortly after its disappearance in January 1953. Regarding the ship « Läckö », the Working Group learned in 1994 that in connection with Soviet search operation in March 1949 for another ship, [the « Liina »], two lifeboats were found containing altogether five dead sailors. Russian archives apparently did not clarify to which boat the men had belonged, but there were indications that further information could perhaps be available from Lithuanian or Latvian archives. In the middle of March 1949 the corpse of one of « Läckö’s « crew member was positively identified outisde of Darlowo. The Working Group did not specifically investigate the case of the « Sten Sture » since the ship was believed to have been lost outside of the Danish island of Bornholm. However, Polish authorities already in 1977 had discovered the wreck of the ship off the coast of the Hela peninsula (in close proximity to the wreck believed to be the « Dan »), a fact that was apparently never shared with Swedish officials. Polish divers explored the wreck in 1996 and secured the ship’s clock which was put on display at the Maritime Museum in Gdansk. An article about the exploration (complete with a sketch of the wreck which was correctly identified as having been originally named « Mount Vernon », then « Elisabet », « Sverre Nergaard » and finally « Sten Sture ») appeared in the 3-1999 issue of the magazine « Båtologen », yet the Swedish-Russian Working Group never formally took notice. Neither apparently did the Polish Foreign Ministry. In response to our request, a new report just issued by IPN in December 2010 about the « Sten Sture » contains some important new details but also leaves key issues unresolved. The report now officially confirms that the « Sten Sture » was found without the load of coal koks the ship’s captain had already signed for. The official departure logs indicate that the boat left on January 25, 1947 at 24:00, « loaded with koks ». This is three hours later than previously assumed. IPN concluded that the « Sten Sture » had most likely suffered a fatal encounter with a powerful mine, perhaps due to severe icy conditions.While drift mines definitely posed a serious risk in the years immediately after World War II, experienced sailors like the crew of the « Sten Sture » were quite adept at avoiding the danger. What caused the ship to drift into more dangerous waters? The body of only one of the nineteen crew members (Joensson), wearing a lifevest, was found at Bornholm two months after the ship’s disappearance. According to IPN, no traces of the other men, dead or alive, were entered in any local administrative records or were found by the local population at the time. One other possible scenario is that Polish or Soviet authorities or rogue agents detained the « Sten Sture », possibly for carrying illegal cargo or persons, and then took the ship to the area where it was later discovered. The known damage sustained to the « Sten Sture » does not appear to be typical of an encounter with a mine alone (the whole top was shaved off and the bottom remains largely intact), so it is possible that the ship was blown up and then sunk. It is unclear what would have happened to the crew in such a scenario. The « Sten Sture » disappeared right after the key January 19, 1947 elections in Poland that cemented Soviet control over the country. In the weeks immediately preceding and following these elections, prominent opposition figures were either jailed or made the decision to flee. It is also known that since 1946 the « Sten Sture » had made regular stops in Fårö, Gotland, to pick up unspecified cargo. Fårö at the time was off limits to regular shipping traffic as a center of Swedish intelligence operations. Private research inquiries to several different Russian Archives, forwarded by the Swedish Embassy, Moscow in 2009, yielded no new information. Astoundingly, until the year 1999, neither the Working Group nor the Swedish Foreign Ministry had thoroughly examined its own files or Swedish intelligence material regarding « Kinnekulle » and « Iwan ». In fact, some of the most important information from Swedish sources about the possible fate of the two ships came from independent researcher Jan Sjoeberg who was not a member of the Working Group. It was he who was the first to realize that it had been Swedish intelligence [Thede Palm] that informed UD in 1948 about the alleged transfer of the crews to a Russian ship called « General Suvorov ». According to Russian officials, the suspected boat in question [« General Suvorov »] was actually called the « Alexander Suvorov » and had been on call in the Mediterranean when the two Swedish ships disappeared. The Working Group could not confirm that the crew of the « Kinnekulle » had been transfered to any Soviet vessel in 1948. In 2000, Swedish Foreign Ministry official Gunnar Haglund authored a long memo (prompted by Jan Sjoeberg’s ground breaking paper about the two ships  and an article in the Polish magazine ‘Polityka’ by Swedish journalist Peter Johnsson) that suggested a variety of possible ways to follow-up statements from witnesses who had reportedly encountered members of the crews in Polish prison after 1948. The Swedish side also placed advertisements with requests for information in the Polish and Russian media, but apparently received few leads. Johnsson’s article showed that Polish authorities had closely observed Swedish ship traffic in the late 1940’s and records regarding alleged smuggling activities were to be found in different Polish archival collections that had not been reviewed by the Working Group. 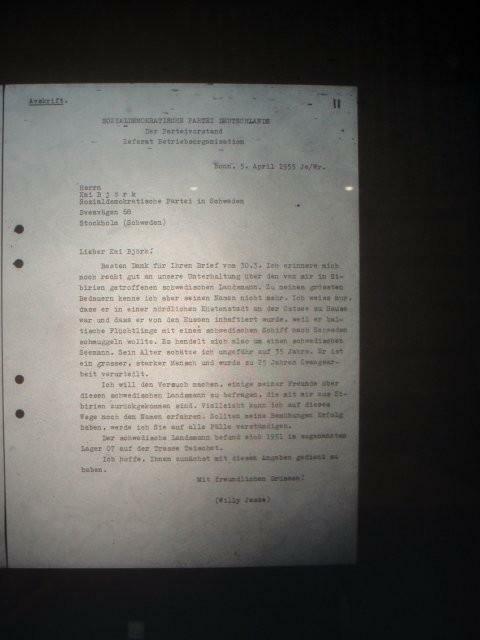 Also in 2000, the Swedish Ambassador in Warsaw, Mats Staffansson, reported to Stockholm that IPN’s investigators had informed him that no names of Swedish sailors appeared in the registers of the notorious Mokotowo prison for the year 1948, nor did the name of a central witness in the « Kinnekulle »/ »Iwan » drama [Juljan Wyszykowski] who claimed to have heard of Swedish sailors shortly before his release from prison in 1948. Another Swedish Arbetspapper from 2001 [9-27] clearly emphasizes, however, that the prison registers were often found to be incomplete and not fully reliable. In 2002, IPN issued a report that argued against opening a formal, legal investigation into the disappearance of « Kinnekulle » and « Iwan » since investigators had found no concrete evidence that the ships’ crews had been intentionally targeted or taken prisoner by Polish communist agents. At the time, Sweden did not present any of the documentation from its own intelligence archives that outlined the Swedish Defense Staff’s use of Swedish vessels in intelligence gatthering activities or its very early suspicions that the boats had in fact been singled out by Polish agents and had fallen victim to an act of intentional retribution from Polish authorities. With such information, IPN’s reviewers may have come to a different conclusion. The other 10/11 ships did not figure prominently in the review of the Working Group; the fate of their crews were not discussed in detail after the initial meeting of the Group in 1993. Some archival searches were conducted for « Silvana », « Vale » and « Vestfart » in Poland and East Germany, without results. According to historian Kenth Olsson, in particular the « Silvana may have aroused Soviet suspicions since it was equipped with state of the art technology when it disappeared in (December) 1960. » [« Misstankar finns att Silwana, som var utrustat med toppmodern teknisk utrustning, med dess uppseendeväckande antenner och master väckt sovjetiska militärens nyfikenhet, betraktats som ett spionfartyg och tagits i beslag. » Kenth Olsson, Populaer Historia, 4/1992]. The ship did in fact have a radio telephone and appears to have been laying at anchor when it disappeared. The wife of the « Silvana’s » captain pointed out these facts in a letter to UD in February 1961. She also stressed that the ship had been carrying a cargo of light buoys which should have floated in case of an accidental sinking. After UD forwarded a request for renewed efforts to search for the ship, providing for the first time information about its special cargo, Polish authorities reported that they had found a lifeboat as well as a number of light buoys off Ustka, Poland in late March/early April 1961. This contradicted earlier official Swedish reports which had stated that pieces of the « Silvana » had been recovered outside of Landsort (Sweden). The Working Group was most seriously hampered by lack of access to Polish and Soviet intelligence documentation. In 2001, Nils-Urban Allard pointed out in an internal memo that the reviews by IPN regarding missing Swedish ships and their crews did not include access « to documentation which deals with Polish operational intelligence work »; and he added: « This is the type of documentation that is best suited to shed light on the truth…. » [« till dokumentation som beroer polska underraetelsetjaenstens operativa verksamhet… » And he added: « …Det torde vare den typen av dokumentation som baest kunde belysa den verkliga sanningen ….. » ] Such an omission then constitutes another serious gap in the investigative record. According to several experts on the archives of the Polish Security Services, access to many of these collections remain seriously restricted. The records also suffer from extensive gaps, due to document destruction, a complex organisational structure and a lack of proper findings aids. Corresponding material should be available in Russian archives but is currently almost completely inaccessible to researchers. A formal criminal probe in the cases of « Kinnekulle » and « Iwan » might have been able to provide access to the very intelligence material that so far has remained out of reach for investigators. That documentation in turn could have perhaps provided leads in other still pending cases. Official records reveal that the highest levels of Polish Intelligence were involved in monitoring the activities of Swedish ships. Key figures involved in illicit smuggling operations, like a Swedish shipping broker called Karl Nilsson, were detained for years and extensively questioned. The interrogation protocols and other investigative materials in the case could provide important clues or leads to new, as yet undiscovered records in Polish and possibly Soviet era intelligence archives in Russia. So could the operational records of Soviet era Naval forces. Recently released documents show that Soviet Naval commanders in 1952 petitioned Soviet Minister of Defense Bulganin to suspend a British-Soviet fishing agreement, because British fishing boats were suspected of conducting espionage work. As we now know, the suspicions were justfied, because Britain had instituteded several programs that would later cumulate in « Operation Hornbeam », the use of fishing trawlers for photographic surveillance of the Soviet fleet in the Barents Sea. In his memoirs, Thede Palm admits that Sweden actively participated in this type program, including earlier forms known as « Tiara » and « Long Look », which monitored the Baltic and Black Seas. « I do not know how many cameras we had loaned out to different ships, » Palm wrote. (Palm, p.53). The program had its origins immediately after the war and ended only with the unexplained loss of the British trawler « Gaul » in 1974. If the Soviets had suspicions about British boats, they probably had similar concerns about Swedish fishing and commercial ships. The Working Group, however, did not take up the issue of espionage in its discussions with the Russian side and did not have access to Russian Naval intelligence records. Even if none of the disappeared boats had any involvement in espionage work, Swedish officials would have perhaps been inclined to downplay any difficulties encountered with Polish or Soviet authorities. In 2001, Nils-Urban Allard outlined in a memo that Polish officials considered the detention of Swedish sailors in Polish prisons unlikely, but not altogether impossible. Allard said that he had been informed by well placed Polish sources (the Public Prosecutor’s Office) that the Polish Security Services, operating under the Soviet NKVD, maintained unmarked cellars for the detention of prisoners who were not entered in the official record. He says that the only way Polish authority could identify the victims held there was « by the graffiti on the walls. » In the same memo, Allard also indicated that prisoners detained by Soviet authorities at sea were likely to have been taken to secluded military bases or installations, away from Polish control and supervision. One of those was Swinoujscie, others were at Elbing (Elblag), Kolobrzeg (Kolberg) and Kaliningrad. Some Swedish Cold War experts argue that it would have made little sense for the Soviet leadership to attack Swedish vessels and to imprison their crews, although acts of provocation and retaliation as they may have occurred for « Kinnekulle » and « Iwan » cannot be excluded. Polish agents in Sweden were known to have traced any illicit activities of Swedish ships and they worked closely with members of the Soviet Embassy, Stockholm. Other Swedish historians also point out that if any Swedish or foreign agents had been discovered, Stalin would have used their arrest to create an international incident to publicly embarrass the countries involved. However, there is a precedent that indicates that the Soviet leadership might have been content to bide its time before publicly revealing the capture of any Swedish crew members. In 1950, almost the whole agent network Sweden had sent to the Baltic countries, in close cooperation with U.S. and British intelligence, was exposed. Many were killed or arrested and some spent more than a decade in Soviet captivity. Yet the Soviet leadership waited seven years before making this fact known to Sweden in a welltimed public announcement in March 1957. [Only a few of the agents survived and returned from captivity] Ensuring Sweden’s status as a neutral country had always been a major post-war priority of Soviet foreign policy, so such consideration may have played into the decision not to cause a public scandal. It also cannot be excluded that Swedish ships were targeted by independent Soviet or Polish commandos purely for profit motive. There is currently not a single documented case of a missing Swedish sailor in Polish or Soviet imprisonment in the Cold War, although there are several witness testimonies who describe meetings with such persons in both Polish and Soviet prisons. [see Document 3]. Progress can currently only come from proper review of key intelligence files that so far have remained unavailable, especially in Poland and Russia, but possibly also from Britain and the U.S. Lack of meaningful access to key operational intelligence records in Russia have affected the progress of other investigations conducted by official Working Groups, such as the search for the four men still unaccounted for in the loss of the DC-3 that was shot down over the Baltic sea in 1952 and the question of the full circumstances of the fate of Swedish diplomat Raoul Wallenberg after his trail breaks off in Soviet jails in 1947. It is clear that these cases can be solved, the question is simply when the respective parties will muster the political will to do so. Document 1: Letter from August 1993, Polish Ministry of Foreign Affairs to Swedish Ministry of Foreign Affairs, informing Swedish officials about discovery of a wreck in Polish waters believed to be the ship « Dan ». Document 4: CIA document, President Truman in 1949 requesting the CIA to provide information on the importance of Polish coal for Swedish steel production and, in turn, the importance of Swedish steel for the manufacturing of Czech munitions. It constitutes a potential reason why any losses of Swedish ships were not seriously pursued by the Swedish government. Similarly, Sweden’s involvement in intelligence operations in the Baltic sea may have provided an additional reason to downplay any Swedish losses. Redfearn, Mason and Aldrich, Richard J (1997). The Perfect Cover: British Intelligence, the Soviet Fleet and distant water trawler operations 1963-1974, Intelligence and National Security: 12:3, 166-177. Sam Nilsson, Stalin’s Baltic Fleet and Palm’s T-Office: Two Sides in the Emerging Cold War 1946–1947 (Stockholm: Swedish National Defence College, 2006).